The Spanish man who ran onto the pitch at the World Cup final and tried to place a hat on the trophy was fined 2,000 rand ($260) by a South African court. Jaume Marquet Cot, 34, also known as 'Jimmy Jump' is a habitual pitch invader. Cot sprinted onto the field at Soccer City ahead of kickoff at Sunday's final, but was brought down by a punch from a security official just before he could get to the trophy, which was near the players' tunnel. 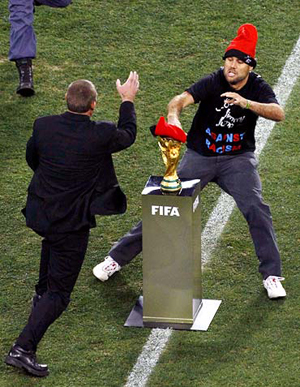 Cot had been trying to place a traditional red barritina hat, which symbolises freedom, on top of the World Cup trophy.